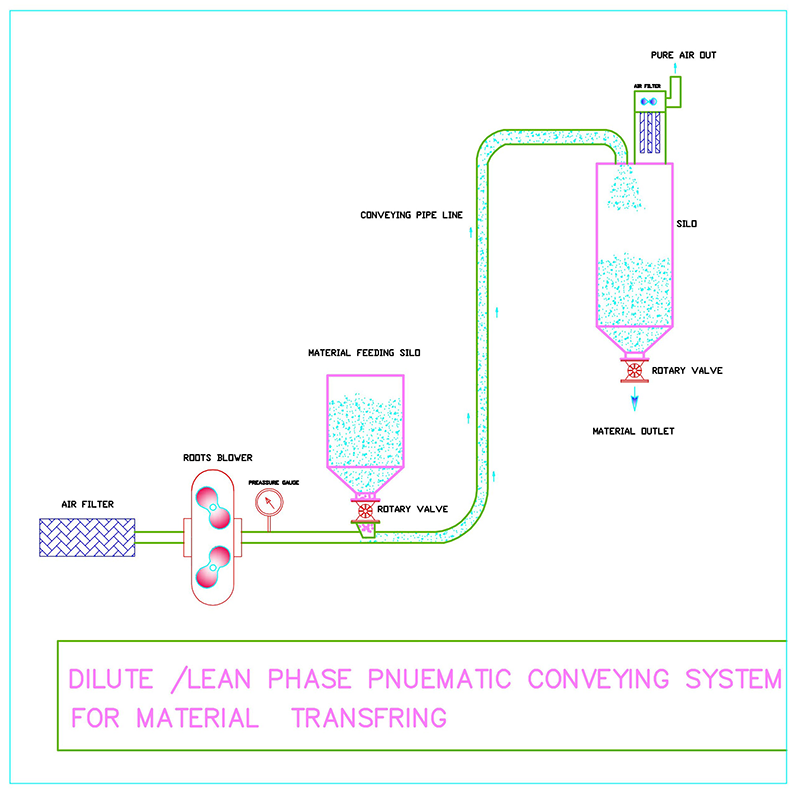 Dilute phase conveying is the most common used method of transporting materials. This process uses a relatively large amount of air to convey a relatively small amount of material and at lower pressures than dense phase systems. The material is transported at high velocities through the system while being suspended in air. It is often referred to as suspension flow because the particles are held in suspension in the air as they are blown or sucked through the pipeline. To keep the material in suspension, it is necessary to maintain a minimum conveying air velocity that, for most materials, is of the order of 2500 - 6000 fpm. There is virtually no limit to the range of materials that can be conveyed with dilute - phase system. Products commonly conveyed in dilute phase systems include flour, resins, specialty chemicals, ground feeds, and granular and palletized products. Of the various types of pneumatic systems, a dilute phase system will generally be lowest in capital cost. 3. transfer line including piping, elbows; divert valves (flex-tube diverters, wye-diverters, plug diverters and other line diverter configurations). Positive pressure systems operate above atmospheric pressure and are used to convey bulk materials from a single or multiple sources to one or multiple destinations, over medium distances and with greater capacity than possible using vacuum systems. A typical positive pressure dilute phase system will consist of a rotary valve; pipe-work which would include long radius reinforced bends; a filter receiver or cyclone/filter arrangement; and positive displacement (roots type) air blowers. The schematic below shows a typical arrangement of the components of positive pressure systems.